Recently I became ashamed of my Japan. I immigrated here about 16 years ago and have just become a Japanese citizen. Now like all countries Japan has its share of racism but had never truly worn it on its sleeve as a badge of honor, as it was and is no honor to be racist. Yet I find that I wish more and more that the old die sooner rather than later. This has to do with two people, one is the Japanese Sumo Champion. 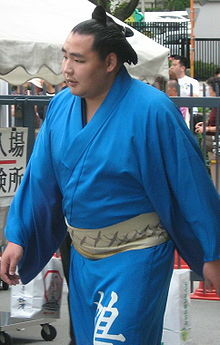 He is considered to be the greatest Sumo wrestler of all time. He is just dominating the sport. Yet he will never be accepted or even offered the position of Master of Sumo. And the sumo association is not shy about the reason. He is not Japanese, that is it. I was and still am shocked that such dispicable behavior exists in Japan today. And not just that but from high class people in Japan. I am not talking about the Japanese rednecks referred to as Yankies here in Japan, but people in high office and official leaders of the sport. For that very reason I am ashamed for them, of them, and disgusted by their public shaming of this great great wrestler. The other person is a lovely person. Miss Universe Japan Ariana Miyamoto born in Nagasaki. But that fact that she is half Japanese the racism has started to come out of the wood work. And the disgusting thing about it is that the people are openly being quoted in newspapers as to the only reason they do not want her to be Miss Japan is because she is half Japanese. They do not care that she was born here, or the fact that she identifies as Japanese. And when you hear her story you, you hear a story of bigotry and racism in Japan. And this disgusts me. So how can I make Japan better. Well I speak about it. I bring the attention to people of the world that all of Japan is not as racist and bigoted as the assholes who spout such hatred and vile. I dream of the day when racism will be gone but I fear that as long as pride over birth right exists we will not have it. I ask that you reblog this and share it to get the word out that Japan has bigotry and racism just like every other country but that there are people like me who want it to stop and will speak out against it. I am proud of these two who have broken through so many barriers and shown just how far someone can go in a country as closed minded as Japan. New York has nothing on Japan. If you can make it in Japan you can make it anywhere. My own personal experience in my new post Oh my Japan persoanal. Mayhap it is not truly the intent of racism, or bigotry. Take a look at our elders, across the board, all races, most everyone’s grandparents fit the profile of being ‘set in their ways’. We accept that sometimes it’s not the intent of hatred, but fear of change, fear of losing their identity, their culture, everything that was part of what they knew and loved, held tight…their security blanket if you will. When one has a belief that differs, sometimes it is merely the lack of understanding fully the other parties side that causes the actual conflict. Then again, mayhap I’m wrong, tis merely my point of view. Have a peachy day~! Interesting point. And I am sure some may fit your point. Reblogged this on screaming from my deathbed. I don´t see that as racism. It´s just their culture. If their rules is that for this and for that you have to be from Japan then that´s their rules. I´m nobody to criticise the people that invent all the crazy gadgets and have in my opinion a damn good work ethic. Now, about Miss. Universe, now there have to be exceptions in this arena, make her whatever she wants to be. Look at her…hot di di hot! You take an interesting view. So Miss Universe is ok to go for what she wants because she is good looking? Ok, that is your opinion but it is not one that can be taken seriously. As for the the Sumo wrestler, he has to accept the racism because of cultural things. That is completely wrong. This whole idea of it’s cultural or it’s a religious freedom, as excuses to discriminate anyone is wrong. Take a look at what the Gov. of Indiana just signed into law. Basically giving business the right to discriminate based on sexual orientation. And he even had the gall to go on TV and defend the bigotry behind the mask of religious freedom. Wrong is wrong and discrimination in any fashion is wrong. This is sick. shame on Japan. It just goes to show that the USA is not the only place where these things happen and in fact when we go around the world we see so much more bigotry than we would care to admit. For me it is wrong, and wrong is wrong no matter the excuse. Reblogged this on Loco's Patronus. All the hateful, anonymous comments towards Ariana Miyamoto on the internet were shameful. Do you think someone like 沢尻エリカ would have the same things said about her? I think Japan is slowly changing in terms of diversity since I came here 10 years ago, but and it makes me think about what would happen if I have children in the future. It’s time to stop whining and complaining about someone because they have mixed heritage. Exactly how do you measure how “Japanese” someone is? When will they be “Japanese enough” for it to not be an issue? It’s absurd. I agree with you 100%. I have a three year old boy and part of me was relieved that he took after his mother because he looks more Japanese. This is due to the fact that I do not want him to to suffer. And I have told my wife if he faces any racism I will confront the people because I am completely against discrimination. I came to Japan 16 years ago and have become a Japanese citizen but have been told to my face that I will never be Japanese it does not matter what a piece of paper says. There is racism everywhere, but all-in-all Japan is doing a great job. I lived in the US and it is no picnic there either. Glad to be back! I laugh when I see people who live in Japan say they have experienced no discrimination here. Have they never tried to rent an apartment? Get into certain clubs, bars, restaurants or onsens? And don’t get me started on the police- awful, lazy, racist, corrupt. For those who haven’t experienced it, it’s just a matter of time. Other apologists say that Japanese are just shy or scared to use their English. Well, they need to get informed! They need to be educated. And you know that won’t happen under Abe and his cronies. Seems to me since I got here that the attitude toward foreigners has barely changed since 2000, or actually even gotten worse. I love Japan, I really do. But if you are preparing to live or work here, brace yourself for a rude awakening. It’s ok because it’s their culture? It’s 2015 – that doesn’t fly anymore. Good luck with the 2020 games. What’s most heart-breaking? When you explain this to Japanese friends, they have no idea, can’t believe it, don’t want to believe it and even get offended. Tell a reasonable Australian that Australia is racist, most will say “Yeah, I know, but the good ones are TRYING to work on it”. We need more Japanese to have the same attitude. Change from within. And can we please stop using the term “haafu”. I know, I know, some of you will say, it’s just the Japanese way they are trying to convey mixed-race. And if any of you have mixed-race kids in school here, you know they have a tough time with that. Kids can be cruel. I’ve always hated that word. Is it just me? Start small, discourage the term. This is coincidental, but I was checking out who Trevor Noah was, the comedian chosen to take over from Jon Stewart. He’s hilarious, but one of his jokes just a happens to back up what I said about the term “haafu”. He is from South Africa and his mother is black and his father is white. Please watch it all, but I love his joke from about the 2:20 mark. “Why half? Why not double? Twice as nice?”. Great response to teach your kids to use in the playground against bullies! Yeah I saw that. And the amazing part and if I remember this correctly was that his mother was arrested for wanting to be married to a white man.